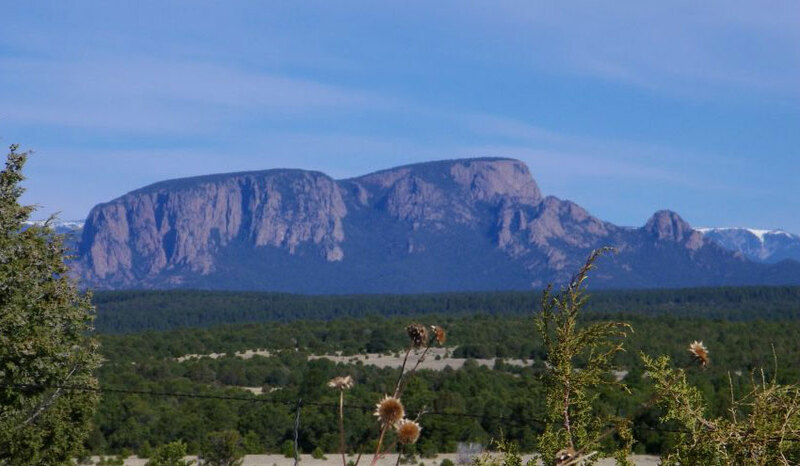 Just outside Las Vegas, New Mexico lies one of the best kept secrets of the Southwest. Near the sleepy village of Montezuma, alongside the Gallinas River, is a 90,000 square foot Queen-Anne style castle. 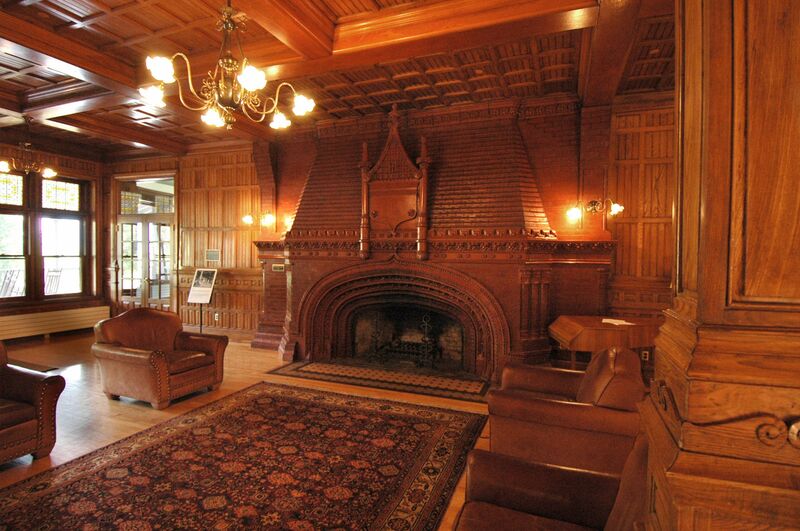 The castle has a fascinating history, dating back to 1882. The Montezuma Castle is a 400-room structure, bordered on one side by the river and on the other by forested foothills. The Rocky Mountains are just minutes away to the West, and to the East are the Great Plains. Throughout its existence the castle has attracted notable clientele. Ulysses S. Grant, President Theodore Roosevelt, Japanese Emperor Hirohito, and Prince Charles of Wales are among its many famous guests. It has had several diverse incarnations; as a luxury hotel, a spiritual center, and now an International Baccalaureate school. 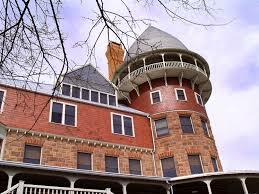 Built in 1882 it was the first building in the region to have electric lights and an elevator. The castle became an international destination due to the hot mineral baths on the grounds. The mineral baths were proclaimed to have medicinal properties. Many flocked to the springs to ease the pain of a number of ailments, including tuberculosis, gout, dyspepsia and chronic rheumatism. Guests were pampered at the baths by a staff offering a variety of services, from mud baths to massage. The hot springs have been in use since around 800 AD, when indigenous tribes are believed to have used them for purification rituals and religious ceremonies. 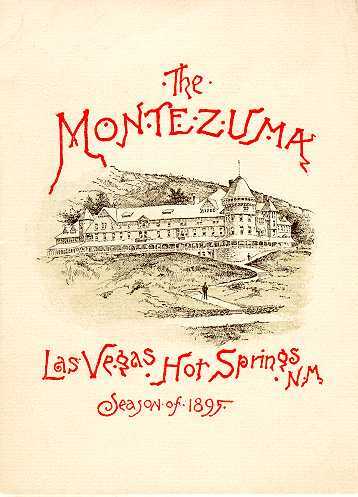 Around 1840, the Mexican government granted the hot springs and surround area to American entrepreneurs who built various structures and bathhouses in hopes of capitalizing on the legendary healing waters. In 1882, businessman Fred Harvey (founder of the Harvey House hospitality chain) constructed a luxury hotel at a cost of $300,000. This was called “The Montezuma”. A railroad spur was constructed from the nearby ATSF railway all the way to Montezuma so guests could travel comfortably by rail, some in private Pullman Cars. A large resort was erected with elaborate gardens and beautifully landscaped grounds. Great care was taken to install electric lighting – the first in the region. Tragically, just a year later an electrical fire broke out and burned the building to the ground. Undaunted, Harvey rebuilt the hotel, hiring Chicago architectural firm Burnham and Root to build an even grander hotel, featuring bowling alleys and billiards rooms. Opening it’s doors in 1884, this new structure was advertised as being fireproof, with great care taken on the electrical wiring and water hoses running along the halls. 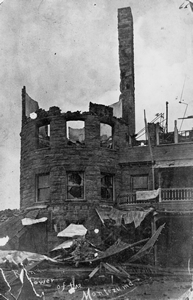 In a stroke of bad luck, another fire broke out – this time in a turret at the top of the hotel. Unfortunately the firehouses could not reach this area, and much of the building burned. In 1886, the structure was rebuilt once again, and aptly named “The Phoenix”. Harvey realized this name echoed the previous misfortunes, and soon changed the name back to The Montezuma. Repeated misfortunes of the castle provided a such colorful background in the book “Child of a Rainless Year” by Jane Lindskold that the castle itself seemed a character in the story. An economic depression in the 1890s in the US greatly decreased the number of visitors, and the hotel limited it’s operation to summers. The hotel closed its doors for the last time in 1903. From that time forward the castle went through a series of name changes and repurposing. In the early 1900s boxer Jim Flynn used the building as a training center for his landmark 1912 fight with Jack Johnson which took place in nearby Las Vegas, NM. The YMCA bought the building in 1913, but never actually made use of it. From 1922 – 1931 the Southern Baptist Convention owned and operated it as a seminary. Then in 1937 the Catholic Church bought the building and ran a Jesuit Seminary to train priests until 1972. In 1981, a hundred years after the original castle was built, the property was purchased by philanthropist Armand Hammer. 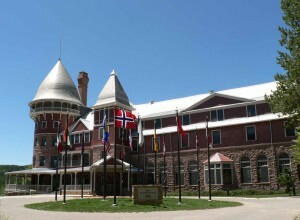 With encouragement from Prince Charles, who was then president of the United World Colleges, the building and surrounding campus opened as the United World College of the American West in 1982. Today the United World College still occupies the campus, offering an International Baccalaureate curriculum to students from around the world. 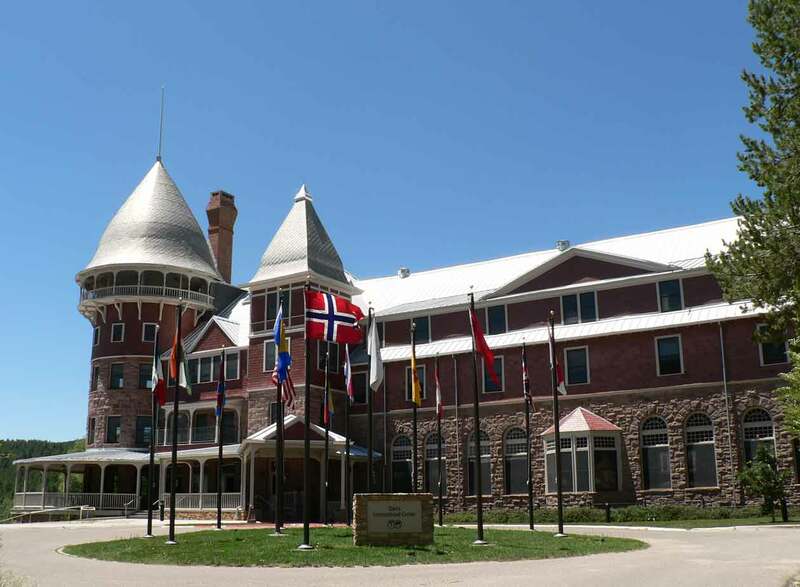 Currently about 200 students from over 70 countries attend the boarding school at Montezuma. You can walk through the Montezuma Castle on student-led tours on Saturdays throughout the year. The nearby hot springs are open and free to the public. Western Life Camp is 10 miles northwest of Montezuma. 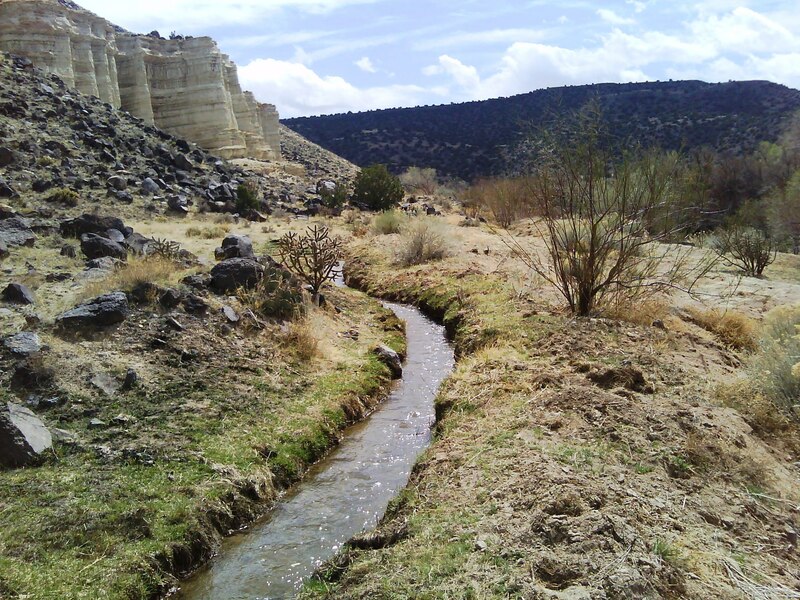 We offer free tours of our beautiful riverside cabins and would be happy to take you by Montezuma Castle and the hot springs when you come see us. Perhaps the mostly widely recognized landmark in the Las Vegas area, Hermit’s Peak looms over the surrounding plains at 10,263 feet. You may remember it from a scene in the movie Red Dawn, which was filmed nearby (the 1984 version, not the remake). It’s worth noting that Red Dawn stars the late Patrick Swayze who later returned and bought a ranch just a few miles from the mountain. 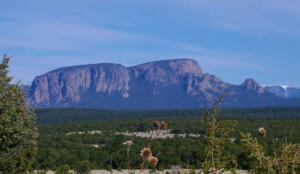 Over the years Hermit’s Peak and it’s sole resident, Juan Maria d’Agostini, have become an important part of the local culture. The mountain was known to the early Spanish settlers as El Cerro del Tecolote, or the Hill of the Owl. 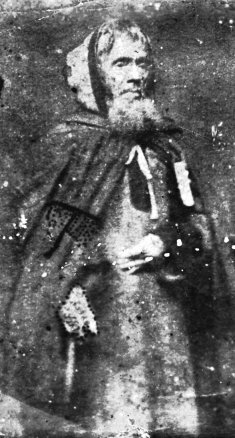 That changed when an unusual figure came to the area in the 1860s. He was described as a short and thin man with a brown eyes and a gaunt face. He wore a long dark cape and leaned on a walking staff. The local residents had never seen anyone so striking and mysterious. 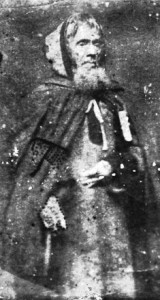 They called him El Ermitano, the Hermit. Born in northern Italy in 1801, Giovanni Maria de Agostini came from a wealthy family. He studied Latin, French, and theology before taking the vow of Saint Anthony the Abbot. He then dedicated himself to a Monastic life of poverty, austerity and virtue. After traveling around in Europe he set out for South America, landing in Caracas, Venezuela in 1839. In South and Central America he traveled from Venezuela to Peru, Brazil, Argentina, Chile, Bolivia, Panama, Guatemala, and Mexico. In 1861 he journeyed to North America and arrived in New York City. Except for voyages which required boats, his only mode of transportation was by foot. From New York he walked up to Canada, and then down to Kansas. 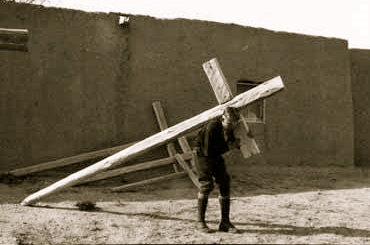 Agostini found his way to Las Vegas, New Mexico accompanying a wagon train from Council Grove, Kansas along the Santa Fe Trail in 1863. When offered a ride on one of the wagons he said that he preferred to walk, and asked only for some cornmeal mush to nourish himself. By this time he went by the name Juan Maria d’Agostini. But to the religious settlers of early Las Vegas he was simply the Hermit. Due to his appearance and wise demeanor he was perceived of as a holy man, a healer and a miracle worker. He claimed to be none of these things. Nonetheless, throngs of locals collected wherever he resided, seeking counsel, healing and miracles. Eventually d’Agostini set his sights on the 10,263 foot mountain, where he finally found the solitude he longed for in a cave near the summit. When I was growing up my parents ran Western Life Camp as a kid’s summer camp. I made the trek to Hermit’s Peak several times. I remember the first part of the hike as fairly mild: gentle hills covered in Ponderosa and Spruce trees, then you reached a giant field of boulders and got your first view of the rocky precipice. The last stretch is the steepest: a series of switchbacks. Finally atop the summit I recall an expansive view; it seemed you could see all the way into Texas. A small somewhat flat meadow provided a great space to relax, eat your lunch and take in the view. We then walked a few hundred yards down one side of the summit to the shallow cave where d’Agostini had resided, and imagined the simple but profound existence he had. 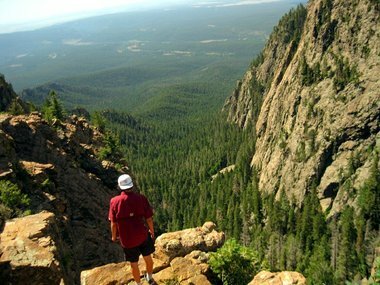 Hermit’s Peak is a beautiful and rewarding hike with a unique history. 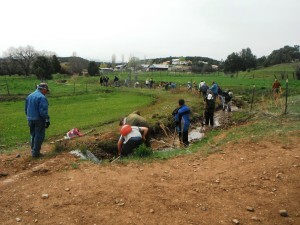 Guests of Western Life Camp can enjoy this wonderful trek, and many other nearby hikes, listed on our Activities page. The trailhead to Hermit’s Peak is 7 miles Northeast of Western Life Camp, in the El Porvenir Campground. 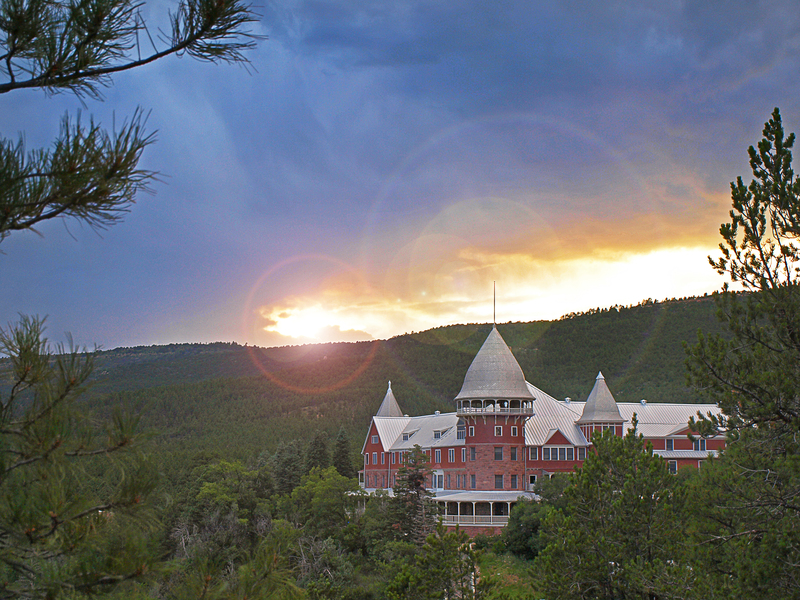 On the way up to Western Life Camp are some historically significant hot springs that share the name of Montezuma with the neighboring village and, previously, with the hotel, or castle, that is now the United World College. One sleepy summer, curiosity got the better of me and I researched the mystery of the name (see references below). After a day or so in the coolness of Santa Fe’s Historical Library, viewing and taking notes from old handwritten bits and pieces of a local legend with many variations, I pieced together the legend with the parts common to most of the old stories. 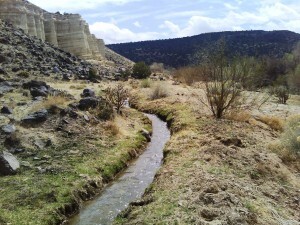 It turns out that the Montezuma Hot Springs were sacred to the people of Pecos Pueblo, one of the largest northern pueblos in its heyday. 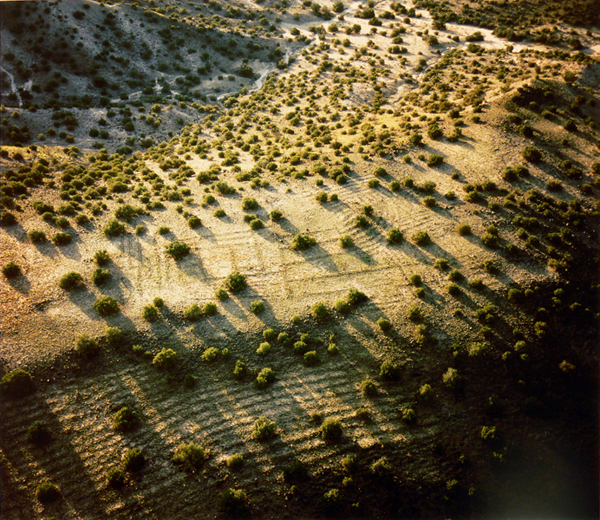 Not only was Pecos Pueblo prosperous and powerful, it controlled access to and from the Great Plains, making it a center of trade where the hunting tribes brought their hides and dried meat to trade for fruits and vegetables grown by the different pueblos. Other trade items included shells obtained from the coastal tribes and rare feathers for ceremonial use. 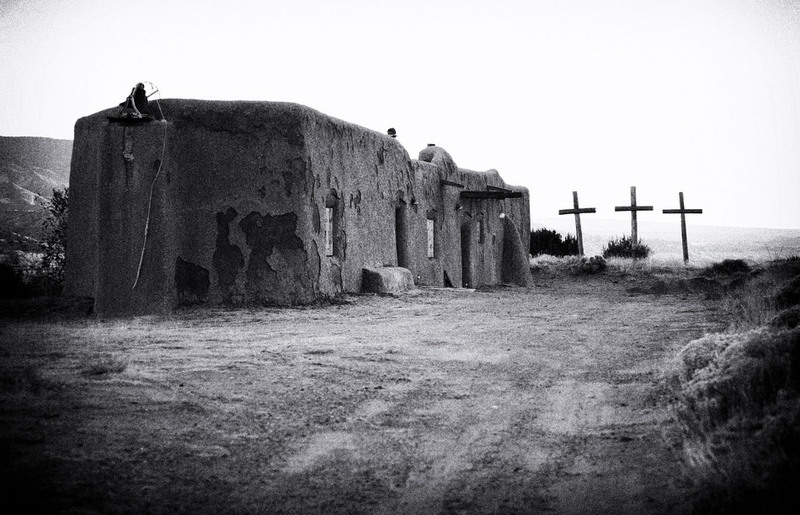 The spiritual leaders of Pecos Pueblo kept the trading fair and had areas that were treated as sanctuary, where members of different tribes who might be in conflict could meet in peace. 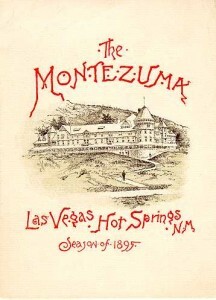 One such place was at Montezuma, at the sacred hot springs. Warriors guarded passage to and from the springs at all times. The strong spiritual traditions were challenged one day because a spiritual leader, a cacique, was near death but had no apprentice to take his place. This could mean the loss of sacred knowledge and traditions, threatening the stability of the people. Death came all too quickly and the people drew lots to select the new cacique. The lot fell to a young man of 13 summers to lead his people. Now this young man had already begun having visions and had begun to feel the call of the medicine path. In his visions, the Thunderbird flew, leading him and his people to a new land and signifying the end of the journey by alighting on a cactus and drawing up a serpent in its beak. The people heard the vision of the new cacique and accepted his spiritual leadership. Where he led, they began following him south as he, in turn, followed the path of the Thunderbird. When the Thunderbird would alight, the people would stop to settle, gather food and hunt to replenish their supplies. From time to time, they stopped at pueblos along the way, where the local people heard the vision and joined the throng to follow the cacique who followed the Thunderbird. It has often been reported that many of the southern pueblos look as if they were instantly abandoned, as if the inhabitants rose from their midday meal and left as one. This was indeed the case as, upon catching the vision of the young and charismatic cacique, they felt the call to follow. Long months passed as the people would be certain that they were at last at their destination as, time after time, the Thunderbird would land on a cactus. The cacique would solemnly remind them that the second half of the vision had yet to be fulfilled and they must continue their migration path until the vision was complete. Finally, one day when the people had all but given up that the vision would be fulfilled in their lifetimes, the second half of the vision was fulfilled. They had been following the cacique who followed the Thunderbird through village after village, growing more and more numerous as each group of inhabitants rose as one and followed. The cacique called a halt and gathered the people to hear the good news, that both halves of the vision had been fulfilled. The Thunderbird had come to rest at last, alighting upon the cactus as he had so many times before but this time he had taken the serpent in his beak. Rejoicing was great as the people knew they were where they were meant to be. 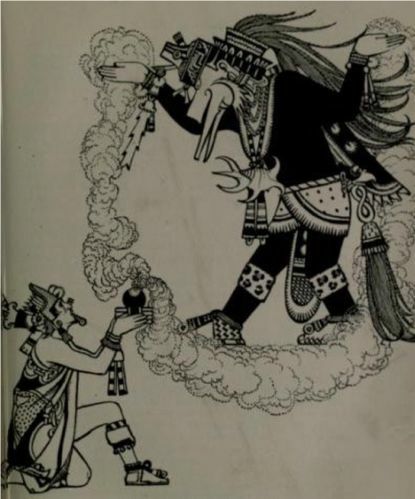 They remained to found a people, a dynasty and a country for the name of the city they built was Mexico City and the name of the young cacique was Montezuma.